Plus standard oven and a Whirlpool fridge freezer. Italia Coffee Shop, First Caribbean Bank and Cave Shepherd Store are ion your door step with free wifi available in the Coffee Shop or Cafe Moyà. It's only 60 seconds to the coffee shop if you are a coffee addict! Golf Clubs abound in Barbados, but the nearest one is Sandy Lane. Lime Grove is a fairly new amazing state of the art shopping centre in Holetown, with every type of duty free store available, Cartier,clothes stores plus Restaurants and cinemas with many more stores to explore.. The Chattel Village has a range of fabulous stores to find unusual Caribbean treasure. We do not allow smoking in the unit or take children. English owner who also runs another unit in Speightstown..
..You have use of owners beach club and swimming pool next to the beach with restaurant, showers sun beds and changing room..
Coral stone tiled en-suite shower room with basin and toilet and window to rear. Air con is available in bedroom at a cost of 60 dollars - plus 3 standing fans.. The gardens are very pretty ..
Just a few minutes stroll away is swimming pool pool which can be accessed by a special card. We stayed in this apartment for one week and really enjoyed our stay. 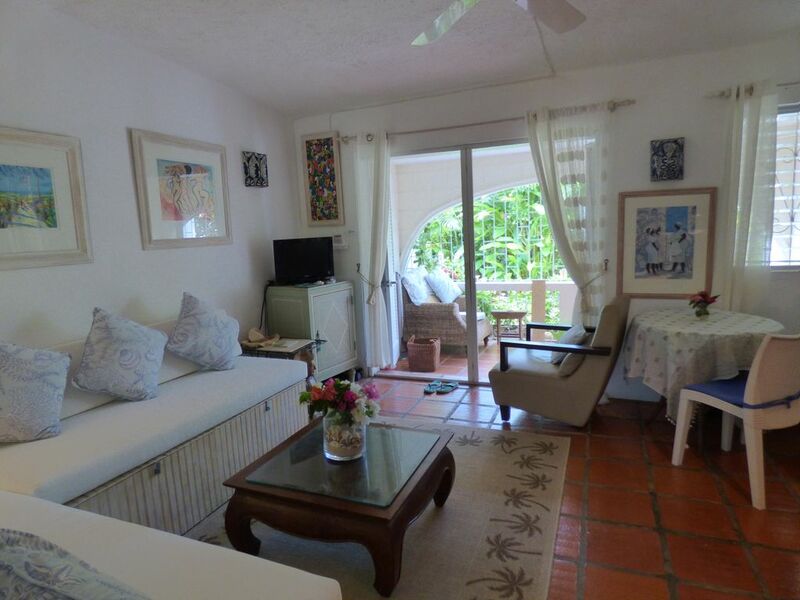 Only five minutes walk to the beach and swimming pool, close to restaurants and bars, quiet and situated in one of the best areas of Barbados. Ideal for the two of us. The apartment has quite a lot of Jude 's clutter in the storage areas and if like us, you need regular WiFi to keep in touch with our businesses then you need to pay extra for the WiFi as hovering in the garden to pick up the nearby cafes WiFi is not really an option. Aside from these minor points it was great. (Just arrived and was surprised to find a few things here that definitely are not mine so removed them??)!! Stayed at Jude's apartment 9th to 20th December, first time in Barbados. Apartment is lovely, spacious and tastefully fitted out with everything you need. Location is great, short walk to Holetown and has two coffee shops immediately adjacent, recommend Cafe Moya over Italia. Both have WIFI which doesn't extend as far as the apartment but can be accessed within a few yards, not worth taking out the WIFI offered as it is expensive and only lasts for a short time. Beach towels were provided which is a nice touch. Nice hot shower, bed comfortable..
Access the the Beach House pool complex is a good facility, we could always find a sun bed and has good toilet and shower facilities. All the nearby beaches are good and accessible. A sealed bottle of chilled water would be appreciated on arrival, we arrived quite late and all local facilities closed. Coin payment of air con a bit of a nuisance, not sure what can be done in this respect, rather pay a bit extra if necessary for mains supplied unit? If staying for two weeks, change of bathroom towels would be nice. More information and advise available on local facilities including bars and restaurants. maybe a rough price indexing, some places are extortionate, some reasonable and some good value, when you want something simple during the day it can be quite hard to find something, juju's is nice, worth a short bus ride. Sandwiches from the MASSY deli a good option if you want to have a day on the beach. We missed the Karaoke night on First Street, (something I would normally run a mile from) but understand this is something special with locals? Local knowledge can make a big difference when you are only there for a short time. If you want to do a shop, getting on the bus to Jordan's may be better option than the MASSY Supermarket which is very expensive (Don't know)? Getting the bus is an experience in it's self though! All in all we would thoroughly recommend this apartment to anyone considering staying in Holetown and from what we saw is a much better option than the South Coast towns. Jacintha is on hand to meet and assist and if you can't get in touch by phone as i couldn't for unknown reasons, Jude can communicate and sort thing out. Thank you for your lovely review and glad you enjoyed the wonderful beaches and the Barbados buses playing their loud music for passengers! There is a great restaurant attached to the pool too. Housekeeping will change linen and clean as and when you want just ask. if a guest leaves AC power on a bill for £200 plus could be incurred. A very nice apartment in a good location. Despite the mix-up when booking and the fact that housekeeping (cleaning & change of bedlinen & towels) only occurred once during our 18 day stay we had an enjoyable holiday. Great place to stay, with only a few minutes from the beach and sea this was an ideal location. Nice little bay across the road for a good swim in the sea, with a beautiful mansion that caught my eye. Very quaint property, extremely well kept and with a loving atmosphere inside. Parking is available, but with so much to offer in Holetown, the use of a car never felt necessary apart from exploring the amazing island. This property is an easy walk to all kinds of amenities, restaurants and bars that gave Holetown its sense of community. The use of a members only beach club meant we could relax in comfort and still have a pool to use when we needed it. The whole trip felt relaxing due to such a smooth process of checking in and out. I will definitely be coming back for another holiday soon. with a pretty garden in great location, close to beaches and shops. I would not hesitate to stay here again. It's a great little find! Thank you for your review and glad that you had a good time. I have lived in the property myself for many years and it is great to be so close to all amenities .. But especially the beautiful blue Caribbean sea and white sandy beach..
Sunset Crest is a fabulous place to holiday, walking distance to stunning white sand beaches, world class restaurants use of Pool in the Beach Club, and within a minute of local mini mart shopping Mall a coffee shop ( with free wifi) bank with ATM and ten minutes walk to the main Holetown supermarket plus the Chattel Village Tourist Shops. The price of this apartment wont break the bank either! Bus stop is close by also. Shopping at the brand new LimeGrove Shopping Mall is a must with duty free goods in many superb stores. Other Activities: horse racing, cricket and polo. Golf: Golf Clubs abound in Barbados, Sandy Lane, Apes Hill Royal Westmoreland, Take your pick!! Security deposit of £100 1st May 2015 to 31st April 2016 Maid service $Bds 60 Excludes air con which is meter controlled Christmas is £600 per week.